Most dogs who display reactive or aggressive behaviors – lunging, barking, growling – do so in large part because they FEEL a certain way about their triggers: fearful, anxious, frustrated, or some combination of the three. Just like with people, a dog’s emotions have a big influence on their behavior. If they no longer feel fearful, or anxious, or frustrated in the presence of a trigger, the reason to react goes away. Working to change a dog’s emotional response to their triggers is one of the most important parts of a behavior modification program, and it’s done through a process called Counterconditioning & Desensitization. When your dog is faced with a trigger that is too close for comfort, the negative emotions they experience set off a stress response in the body that says “Potential Danger Nearby! Prepare for Action!” The physiological changes that happen next are involuntary, meaning your dog has no control over them. During a stress response, adrenaline and cortisol are released into the blood stream. 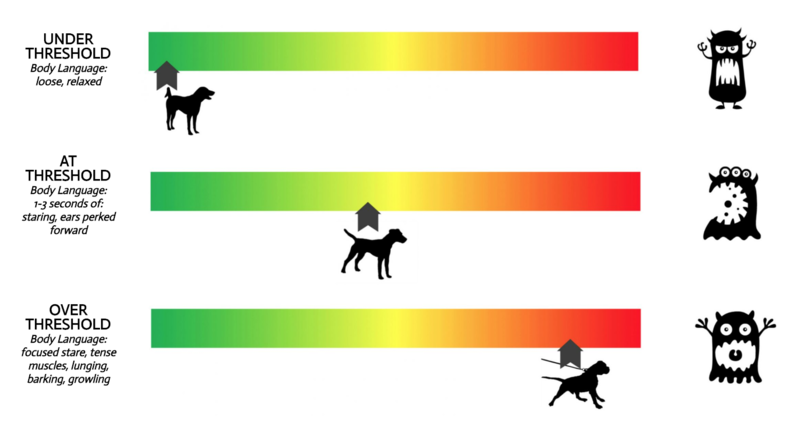 These hormones cause your dog to experience a range of INVOLUNTARY physiological responses: their heart beats faster, their rate of breathing increases, their blood pressure rises. The adrenaline in their system causes tiny airways in the lungs to open wider, allowing more oxygen into the body. Heightened alertness and greater sensitivity to sights and sounds follow, as does an elevated startle response. Our dogs’ brains and bodies have prepared them for action in an effort to help them stay safe. It’s easy to see why the next thing that often happens is lunging, barking, growling, or snapping at the trigger that prompted those negative emotions and physiological stress responses in the first place. 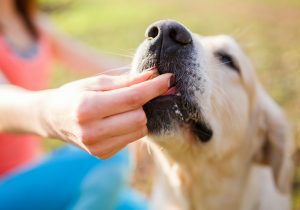 Counterconditioning & Desensitization (CC/DS) uses principles of classical conditioning to change the emotional responses our dogs have to their triggers, from negative, to neutral or positive. Remember, no negative feelings, no more reactions! With dogs, we do more than just exposing them to a trigger during CC/DS sessions. We also add something pleasant or appetitive – like turkey or hot dogs! – in the presence of the trigger to further aid in the learning process. The sweet spot for Counterconditioning & Desensitization is when your dog is just at threshold in relation to their trigger. “At threshold” is the point where your dog notices the trigger in the environment and displays mild concern but is still able to disengage and move onto other things. By allowing your dog to observe their trigger at this low intensity (and providing them extra yummy treats at the same time), we’re allowing their mild feelings of concern to dissipate – instead of escalating into a full-blown stress response – and be replaced with feelings of relaxation. With repetition, the presence of a trigger at that intensity will no longer cause even mild concern. The goal with controlled CC/DS sessions is to extinguish any negative emotional responses to the trigger at the current level of intensity, before moving on and increasing the level of intensity. This allows us to make progress in a way that is efficient and low-stress for the learner, and that addresses the root cause of our dog’s aggressive or reactive behavior. This video from our free Leash Reactivity video series reviews how to use counterconditioning and desensitization techniques for dogs who display on-leash reactivity – lunging, barking, and growling at people or other dogs. If you’d like to learn more, check out our free online course for leash reactive dogs! 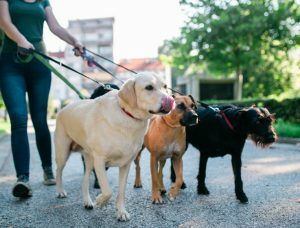 It’s packed with additional info and videos like this, and includes a step-by-step training plan to help improve your leash reactive dog’s behavior on walks.